Knock Parish Church and the Apparition Chapel. Photo: Wejchert Architects and PM Photography. 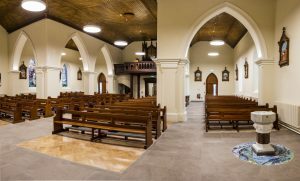 Last Friday saw the latest chapter in Knock’s rejuvenation come to fruition with the opening of the Parish Church and Apparition Chapel following refurbishment works. Both the parish church and Apparition Chapel have been closed since last October to make way for complete refurbishment. The parish church, according to Fr Gibbons, was “greatly missed” over the past number of months. The mid-19th century Stations of the Cross have been cleaned so as to best display the delicate original colours and modelling. The Stations have been in situ in the church since 1910 and were professionally cleaned by sculpture conservator Eoghan Daltun. The seating has been retained and refurbished, while designated wheelchair seating areas are now included for the comfort of pilgrims. The high altar in the parish church is one of the oldest features of the shrine, dating back to 1880 when it was presented as a gift during a pilgrimage from Cork. The Baptismal Font has been relocated from its previous location near the main entrance to a new more prominent position beside the sanctuary, while the floor surrounding the font includes a circle of mosaic on the theme of water, the Christian symbolism for spiritual renewal. The colours of the mosaic were chosen by the artist, Laura O’Hagan to relate to the wonderful colours in the nearby stained glass windows. The iconic church tower was repointed and the entrance porch given a contemporary feel with new sleek glass door adorned with the lamb and cross emblem which is so strongly associated with the Shrine. The Shrine, or Apparition Chapel, now has new glazing on the exterior in order to give pilgrims maximum visibility of the Apparition Gable. The white marble tableau representing the Apparition was gently cleaned and new seating installed. The pilgrimage season began in April and the Shrine has been welcoming organised pilgrimages every weekend as well as daily coach tours from all over the world. All the services at the Shrine are available on a daily basis including the anointing of the sick, daily Mass, confessions, Stations of the Cross and prayer guidance. Knock Parish Church and Apparition Chapel. Photo courtesy: Peter Moloney photography. Young families coming to Knock can take a visit to the award-winning Museum, followed by lunch at Café Le Cheile. The HUB run by the Youth Ministry offers a drop-in centre for young teens and also a kids club for children. Groups coming to Knock can avail of a free guided tour of the beautiful grounds which are spectacular during summer months, or enjoy their own private Mass in the Apparition Chapel. The Shrine Bookshop, also open daily is a lovely space to browse and take in the wonderful collection of books on a broad range of faith-related topics. A free shuttle bus is available daily for those that require mobility assistance. 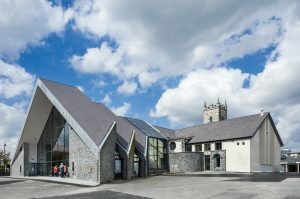 Last year, Fr Gibbons revealed that Ireland’s national Marian shrine in Knock had secured €13.4 million in donations and pledges over a three-year period to finance its structural and spiritual revamp. A target of €14 million set in 2013 was thus successfully achieved. The major part of the money raised – €11.4m – was used to refurbish the 40-year-old basilica which had become dated and worn and was uncomfortable for pilgrims. It has also been future proofed for technology for the decades ahead. One million euro was spent on marketing the Co Mayo shrine at home and abroad, resulting in the first transatlantic pilgrimages from the archdioceses of New York and Boston in 2015 and 2016 respectively. Another million funded a series of new pastoral programmes as part of Knock’s outreach to the faithful in the 21st century. Over 75 percent of the money which paid for the ‘Witness to Hope’ renewal programme, which was launched in 2014, came from the West of Ireland, Fr Gibbons said. 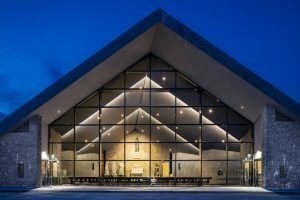 The annual novena in Knock sees over 100,000 pilgrims visit the shrine over two weeks in August.